Tenants fearing they could one day be forced from their affordable Central District units are fighting to stop the sale of their building to a private company. On Wednesday tenants of the Squire Park Plaza Apartments gathered outside their 18th and Jackson building to call on Mayor Ed Murray to intervene. Using a mix of tax credits and federal loans, Squire Park Plaza was built seven years ago as a workforce housing project through an agreement between the city and current nonprofit owner, Central Area Development Association. The city has recommended that CADA sell the building in a competitive bid. While a new private owner would initially have to keep half of the units open to those making under 80% of the area median income, tenants say that over time, the number of below market units would drop. They want the city and CADA to look for a nonprofit buyer to assure the building’s low-to-mid income residents can continue to live there. The residents have organized under the Central Area Action Committee for Affordable Living: Squire Park Plaza Tenants. The group began a change.org petition in June to submit 400 signatures to the mayor to ask his administration to not sell the building. As of Thursday morning, the group was around 55 signatures short of its goal. 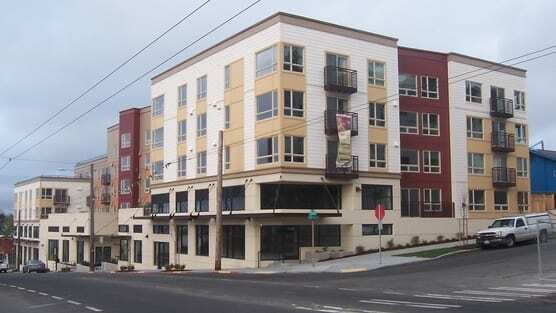 CHS recently wrote about soaring rents throughout the central Seattle area. This entry was posted in News, etc. and tagged affordability, central district by Bryan Cohen. Bookmark the permalink. It has become commonplace for local and international developers to get incentives in the form of tax breaks , zoning variances and special financing to build large complexes with lip service to affordability , sitting on them for a couple years then turning around and selling for a profit. The new owners are well versed at finding loopholes not be liable to initial terms and conditions and tenants lose. Why is the city pushing the current owner (CADA) to sell the building? Is that nonprofit in some sort of financial difficulty?